The famous Bread and Wine Restaurant is situated on the Moreson Wine Estate on the outskirts of Franschhoek. Bread and Wine Restaurant is a typical Cape vineyard restaurant that offers a relaxed, country-chic lunchtime experience. 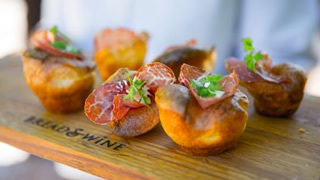 Here at the Bread and Wine Restaurant, Neil Jewell – Executive Chef and South Africa’s charcuterie King – prepares the most delectable dishes using only the freshest seasonal ingredients. The jewel (excuse the pun) in Neil’s crown is his offering of handcrafted charcuterie that rivals the finest in Europe – all with a unique South African twist. Don’t let Bread and Wine’s casual demeanour fool you. This beautiful Franschhoek Restaurant is a firm favourite with foodies from far and wide – and – with an ever-evolving menu of inspiring dishes it’s no wonder it has such a large following of loyal fans. The Bread and Wine Restaurant is also regularly used for the perfect Franschhoek Wedding. Both Neil and his chef wife, Tina, who acts as the restaurant manager, offer cooking classes in the beautiful Franschhoek countryside (there is a minimum number of participants required). Neil heads up a two-day charcuterie course, while Tina shows you how to knead and stretch in her bread-making classes. Bread and Wine Restaurant exudes an old world charm. It is a character-filled, rustic restaurant that has won numerous accolades for its honest cuisine. Bread and Wine offers a 2 or 3 course choice menu only (vegetarian options available) as well as special children menu for under 12’s.